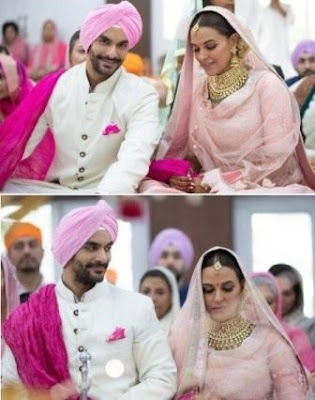 Here comes the biggest surprise of 2018, Pink Actor #AngadBedi is now officially married to stunning and talented #NehaDhupia, confirms the duo on social media! From the pictures, it looks like the wedding was held following Sikh rituals. The two had never openly declared their relationship status and this news came as a surprise to their fans. Neha and Angad maintained a low profile and tied the knot. According to the reports, the wedding was held in New Delhi. Angad, who is the son of cricketer Bishan Singh Bedi, has his roots in Delhi. Neha too has spent her college years in Delhi. On the work front, Angad Bedi is busy with Soorma, which is an upcoming biographical film based on the life of hockey player Sandeep Singh, directed by Shaad Ali. It is produced by Sony Pictures Networks India, The CS Films. Also starring Diljit Dosanjh and Tapsee Pannu play the lead roles in the film. The film is scheduled to release on 13 July 2018. Priyanka Chopra Slays MET Gala 2018!